Confession: I really like pre-seasoned rice/couscous mixes. They’re probably full of salt + preservatives, but I still love them. Especially Rice-A-Roni, which I could eat by the bucketful. The other night, I planned to make a delicious dinner: Slow-Cooker Barbacoa Beef tacos, homemade mexican-seasoned black beans, and, WAIT, WHERE’S THE RICE-A-RONI?! I foolishly had forgotten to buy some, + the baby was in the middle of her long afternoon nap, so there was no way for me to run to the grocery to get some. Alright, I thought. I have plenty of ingredients in this house. Surely I can muster up something? I knew I had plain long-grain white rice, plus tons of seasonings available. A quick google search revealed this Restauant-Style Mexican Rice, which looked delicious, + I had all the necessary ingredients. So, I said a prayer to the rice gods, + gave it a try. And y’all, it was SO good. My husband, a huge rice lover, couldn’t believe that I had made such a delicious, authentic-tasting mexican rice. AND NOT FROM A BOX MIX! It’s a perfect combination of savory, tomato-y, garlicky, bright flavors – all of the seasonings work beautifully together, and the result truly tastes like something you’d get at your favorite mexican restaurant. Now, am I going to give up my beloved Rice-A-Roni? No way. But I *will* definitely be making this delicious + super-easy-to-make rice again – it’s too good not to! Heat oil in a large saucepan over medium heat. Add the rice + stir occasionally until rice begins to lightly brown. Add the garlic, salt, cumin, chili powder, + paprika to the rice, + stir until well-combined, about 2 minutes. Add the tomato sauce, chicken broth, + cilantro. Bring the mix to a boil then turn the heat to low, cover + simmer for 20 – 25 minutes, until the rice is cooked through + the the liquid is absorbed. Remove from heat + fluff with a fork. I looooove Mexican rice! This sounds super! I love Mexican rice, too, but have never been able to duplicate it at home. Gotta try this one! Love that you’re a RAR girl, too! My guilty pleasure is their Four Cheese and I add chicken to it. I could eat the entire pan myself! So glad you’re a rice-a-roni lover, too!! This looks fantastic Amy! Hehe we are suckers for the boxed mexican rice too and I love that you made a scratch version It sounds delicious and easy to whip up – can’t wait to give it a try! i love mexican rice! this version is a lot simpler than mine. will have to try both to compare! What timing. I was just at Boca Loca and they served me about 3 cups of white rice next to my fish. So unappealing. They need to read your recipe. I said to Doug, they could at least season the rice and make it look better. (like yours). Oh heck, who cares about the salt and preservatives-I love Rice-a-Roni! I just love how the rice absorbs all of the flavors of the seasoning and broth. And I love your Mexican Rice. This sounds great! I’ve always wanted to know how to make proper Mexican rice! Love your recipe, Amy. Perfect for the side of any Mexican meal at home! HaaHaaa, I used to eat big bowls of Rice a Roni too :p So glad to have yummy home made recipes like this to count on in a fix. I try not to eat boxed rice (for the very reasons you mentioned). This looks like the perfect compromise! I never seem to make rice that tastes like the restaurant kind. Some good and some not…This looks just like the kind they serve as a side dish! Pinning this one for sure. *Hangs head in shame. * I love those dang boxes of rice and couscous. You’re not alone, my friend. I can’t wait to get in the kitchen and try this rice. My rice skills are horrible, which is why I like the boxed rice mixes. Ah, I need to try this sometime (with veg stock) since all the premade stuff (and the stuff in the restaurants) has chicken stock! I know it’s only a side dish at restaurants, but I am so totally in heart with Mexican rice! I would eat it topped with beans and mole chicken every day if I could! This is on my to-make list! Mmmmm, now you have me craving mole chicken! I wanted a nice side dish to pair with a tasty Southwestern style salad and grilled chicken I was serving for dinner. My son suggested rice so I went in search of a Mexican rice recipe. I found one over at Favorite Family Recipes that looked and sounded perfect. I only adapted it a little bit by adding sautéed onions. The rice was subtle but delicious and we all loved it. This will be my go to Mexican rice recipe. 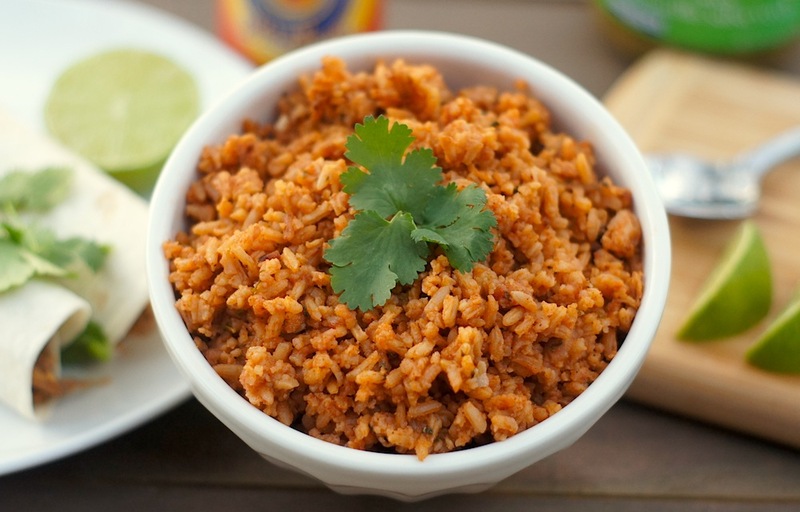 I have tried several recipes for Mexican rice and yours is the winner! This rice is delicious – it will be a go-to recipe I used brown rice and it turned out great. Thank you for ending my search for a great Mexican rice recipe!! I am SO thrilled to hear that, Hannah! And I love your substitution of brown rice – I’ll have to try that next time! I was skeptical, but this was AMAZING! I just used it for this recipe (http://www.myrecipes.com/recipe/speedy-black-beans-mexican-rice), which I originally made with the boxed stuff while we were living in a hotel for a month, waiting for a house to open up.